Cat Trees: Great Fun For Active Cats! lots of fun for your cat! Cats enjoy watching the world go by from a vantage point. Cat trees provide your cat with the perfect place to climb, play, and hang out. Certainly, a cat tree is a great piece of furniture for active cats as it allows them to play and exercise at the same time. Cats will certainly spend long hours playing, or just plain chilling, on their tree. A climbing tree is particularly a great idea for indoor cats. Consider placing the tree near a window so that your cat can safely and comfortably watch outdoor activity. Whether you have older cats or kittens, a tree can prove to be an excellent choice of cat furniture. Smaller trees, with tiered trays positioned at a lower level, give easier access to the young and the old. You can also find cat tree houses and cat tree condos. These pieces serve double duty as sleeping quarters and play areas. Cats of all ages will certainly benefit from these versatile pieces of cat furniture. Indeed, these pieces provide an all-in-one solution for many cat owners. -- Generally, kitty trees come with several tiered shelves or trays for your kitty to perch on and sleep in. This is a great feature for households with multiple cats. Each cat can have his or her own special spot. -- The taller the tree, the more trays it has, and the happier your cat will be. 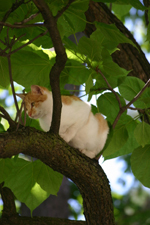 -- Cats love heights and they will certainly love a floor-to-ceiling tree. -- Some trees I’ve seen even come with enclosed caves or houses for kitty to hide and sleep in. Indeed, a cat tree house is a great solution if you can only buy one piece of cat furniture. This is true if you are on an limited budget or you have limited space. -- Most trees come with a sleeping tray or wide platform at the top of the tree. The perfect lookout for kitty! -- Most kitty trees come with carpeted, scratching surfaces. Some even come with additional scratching posts. -- For extra fun, you can attach toys to the tree! -- Trees also come in different sizes, styles, and colors. You can certainly find one that matches your home decor. In addition to traditional cat climbing trees, you can also find novelty trees. For instance, there are trees with hollow trunks for your cat to hide in. Others come with tunnels. There are also rustic, organic-looking trees that look like sculptures. -- Kitty trees should be made of sturdy, strong, long lasting materials. -- The base of the tree should be wide enough to prevent it from leaning and falling over. This is important in order to prevent accidents. If you’re handy, then you can build your own tree. You can find lots of cat-tree plans on the Internet, some are free and some you have to buy. The advantage of building your own kitty tree is that you can customize it according to your needs, including the space you have available to place it and your style. Making your own tree also allows you to choose the materials and colors you like. There are e-books and even books, like Black & Decker 24 Weekend Projects for Pets: Dog Houses, Cat-Trees, Rabbit Hutches & More by David Griffin, that provide you with a blueprint and detailed instructions to help you build your own tree. Building your own kitty tree allows you to make a unique piece you designed yourself while saving some money. Cat gyms for every cat! For more cat lover gift ideas, check these out!